Sell to Us Price: $146.00 each. 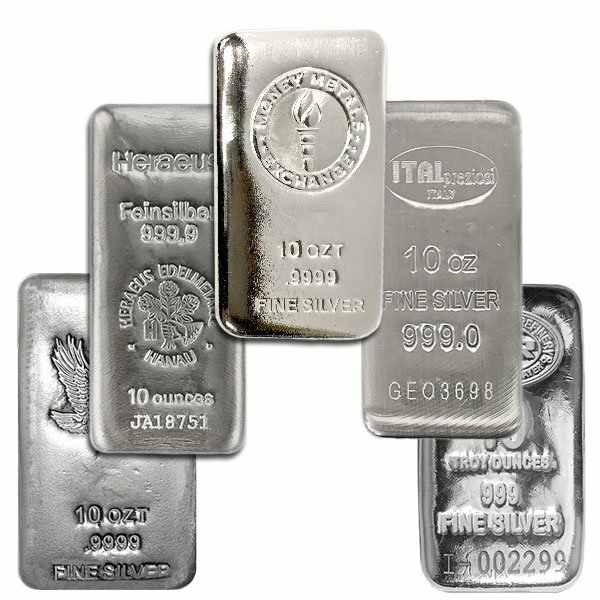 The 10 ounce silver bars Money Metals offer are the perfect choice for investors seeking the lower premiums offered by bars without going overboard when it comes to size. 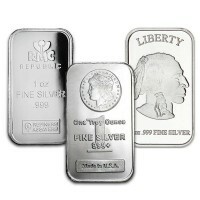 They are great for stacking and for beginners learning how to buy silver. 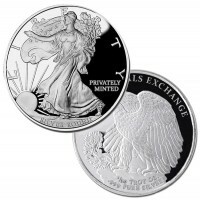 Beside the 5 ounce size offered by Money Metals, the 10 ounce size is among the most popular (and the most liquid) for those collecting silver bars. Investors can buy silver online with confidence, knowing their bars will be easy to sell for a great price when the time comes. 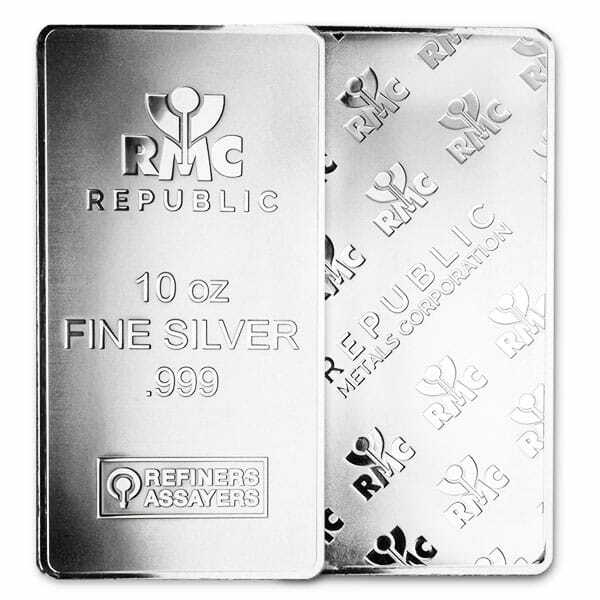 Each and every one of these pure silver bars we offer is made in the USA by refiners offering the highest quality, most beautiful products. 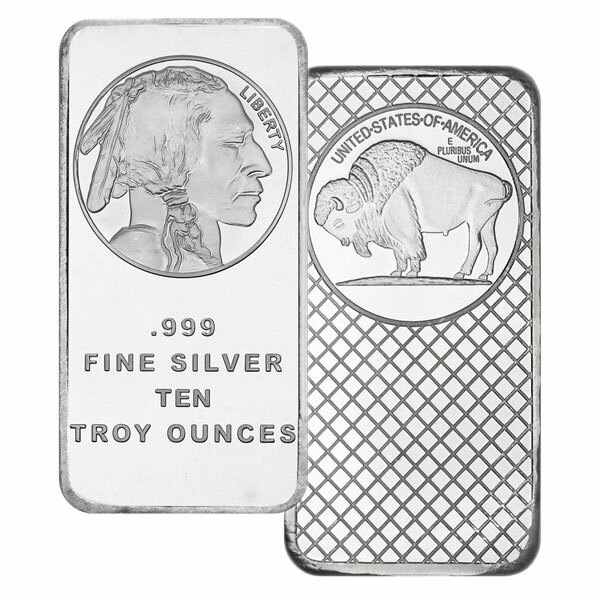 Our silver bullion bars are always stamped with their weight and purity and are often identified and hallmarked with the insignia of the producing institution. Each fine silver bar is individually sealed and protected in plastic. The Johnson Matthey / Engelhard silver bars is among the most well known in the industry, but those firms no longer manufacture under those names. Johnson Matthey has been acquired by Asahi, and Engelhard ceased operations years ago. 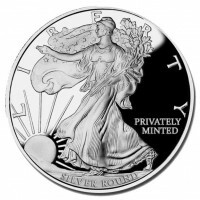 Modern silver 10 oz bars tend to be "minted" rather than hand poured silver. 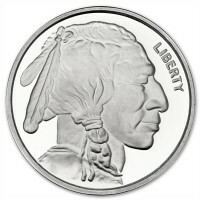 The process of inserting blanks into a minting press generates bars with a more polished finish and clean lines. Minting leads to a more machined look, which many customers prefer. Poured or cast bars tend to be older. While we carry and sell "name brand" bars and put a priority on quality, we do not consider it wise for investors pay large premiums for a particular brand of bar. At the end of the day, the investor may have trouble getting any sort of premium when it is time to re-sell branded bars. Bars tend to be mass produced and therefore make poor collectibles. And there are a number of refiners producing excellent quality. The advantage of bars is in the low premium. Buyers should think twice before giving that up. 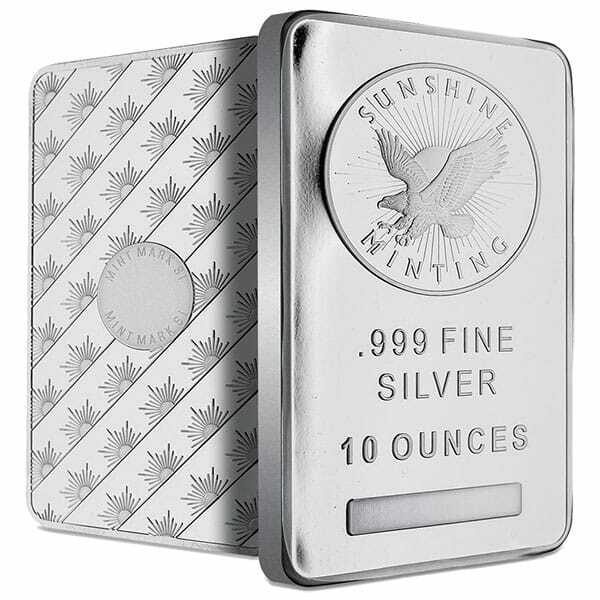 Like other .999 silver bullion products, silver ten ounce bars are perfect for holding inside a precious metals backed IRA account. In most cases investors are not concerned about using the metals held in IRA storage for barter and trade. The priority is on maximizing investment returns, so the name of the game is in getting the most silver ounces for the money. 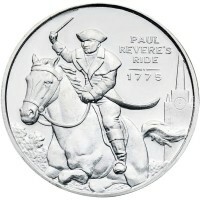 Silver Weight: 10 troy oz. 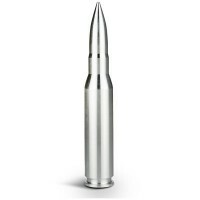 Our current buy pricing is $146.00 each and we will buy up to 500 ounces at this price. Simply call us on any weekday to lock pricing at 1-800-800-1865. I love the product I received. I will definitely be purchasing more in the future! I truly thought it was going to be a much more intense ordering process and then a long delivery time but that couldn't more further from what really happened. Fast is the word. I tried to purchase gold and silver bars from two other companies. After ordering from one and waiting for 10 days to hear from them I received a note saying that they wouldn't sell to me, but could not give me a reason why. I ordered from the second company on January 28th and 3 weeks later I am still waiting for confirmation that they have shipped the package. I ordered from MMX and in 10 days received a note that my check had cleared and that the package was on it's way. A few days later I received a follow up letter to make sure that I was satisfied with my purchase. Guess which company I will be re-ordering from. Just received my order of 10oz Sunshine Mint bars. Extremely happy with the fast and efficient order process. I have never held a 10oz bar of silver before. I was surprised how heavy they are. The Sunshine Mint bars are really something to look at too! It's a good feeling to know that I can look at them any time I want to. I would highly recommend MMX and precious metals as an investment. Just received 20 of the 10oz silver bars and could not be happier. They were just as described. I have purchased several other orders of both silver and gold and would recommend anyone who is interested in getting either gold or silver as presented without the hassle of being pressured to buy a special coin at an elevated price, Money Metals is the place to do business. You see only a few weeks ago I tried another company for my first buy and was pressured to buy a coin that was worth 1/2 of what I paid. Thanks Money Metals for being trustworthy. 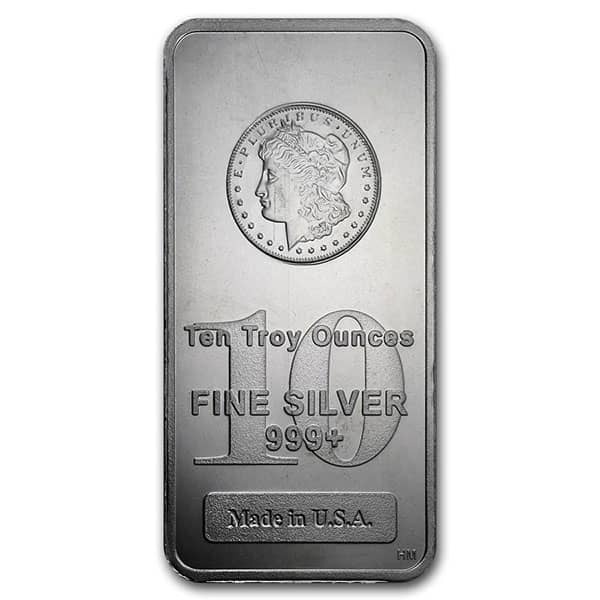 You can now sell your 10 Oz Silver Bars back to us online, at a price of $146.00 each!